I always think long and hard when people ask me for parenting advice. I tell them it was all I could do to parent our own children; I’m not about to advise them on how to parent theirs. The real danger is once you start dispensing advice, it automatically casts you as an expert and nothing invites disaster like billing yourself as an expert. That said, when I do have a momentary lapse of discretion and dispense parenting advice, it is often the advice my mother gave me. 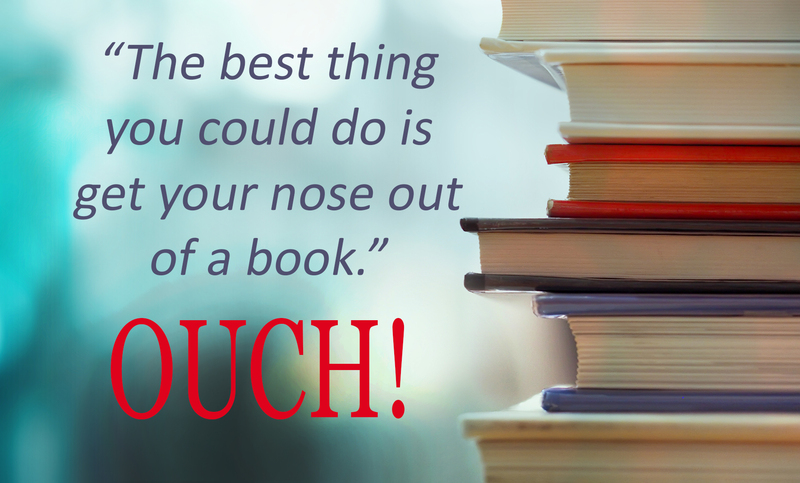 She once told me the best thing I could do was get my nose out of a book. I closed the book I was reading on how to get your baby to sleep, setting it down on top of a book on getting your baby to eat solid foods, which was on top of a book on the importance of playtime with your baby, which was on top of a book about talking to your baby, which was on top of a book on cultivating your baby’s interests in physics, engineering and computer science. I didn’t know why my mother would object to me reading books. All of the books were by credentialed experts—one or two of whom even had children of their own. It was years before I fully understood what my mother meant. She meant it was time to stop reading and start doing. It was time to go with my gut and my heart and become the expert on knowing my own children. She was right, of course. Mothers always are. At least that’s what I tell our kids. My heart told me that babies and children need the same things grown-ups need —to be known, loved, encouraged, given opportunities to learn and grow, fail and try again. My instincts told me that children need boundaries, correction, forgiveness and second chances. A lot of what my heart and instincts told me was similar to what the experts were telling me, but without the cost of a hardcover book. I knew my heart was a good guide amid squeals of laughter, sounds of play and overwhelming love for another human being. I also knew that parenting would be one of the hardest jobs I’d ever had. Sleepless nights and spit up on my shoulder made me a fast learner. This job would require a selflessness with which I was unaccustomed. It would require a strange tension of holding them close and simultaneously letting them go. I also knew it would be seasonal work and that this season would never pass my way again. My mother’s heart told me that my children would learn many marvelous things from books, but the most important things—like how to live life, how to treat others and how to find their way and make sense of this world—they would most likely learn from watching their father and me. Warts and all. Books and experts can be wonderful resources, but nobody will ever know your child like you do. Nobody will ever love your child like you do. You get one chance at this parenting gig. Give it your all. I’m of the last generation that grew up without air conditioning as a standard feature in most homes. We got air conditioning eventually, but only after Mom and Dad were sure we’d endured enough blistering summers to remember what suffering was like. Parents back then were concerned their children might turn out spoiled, so they let kids do things like sweat in the heat. There were no air conditioning services back then that would come in and fix things if it was broken nor were there things similar to hvac coupons that would help you pay for it when you needed to get it fixed. We had a fan. It was a three-speed oscillating number with no safety guard, the kind that could cut your fingers off if you stuck your hand it. We were reminded of the danger every 15 minutes. The fan followed us from room to room. When we had dinner, the fan had dinner. When we sat in the living room, the fan sat in the living room. Everybody we knew had fans. Come to think of it, I’m not sure air conditioning had been invented when I was a kid. The wheel had been invented, but not air conditioners. Of course, we found other ways to stay cool. If you sprawled out face down on the basement floor, it could bring your body temperature down to 117. We also kept the drapes in front of the big picture window that faced west drawn during the summer. Exxon could have started drilling for oil in our backyard and we wouldn’t have known until late September. I was mesmerized by an aunt and uncle who lived on a farm and had a big window fan. It would pull in the cool night air and, sometimes, the smell of cattle as well. When it was really hot, my aunt would put a tray of ice cubes in front of the fan, so the fan would (theoretically) blow cold air. My aunt later became the president of Frigidaire. Not really, but I thought she was a genius. Then the day finally came when Mom and Dad apparently thought we had suffered enough and they bought a window air conditioner. Dad hauled the monster home in the trunk of the car and had to get a neighbor to help heave it into the kitchen window. Luckily these things aren’t as monstrous nowadays and with a bit of research you could probably even find one that you could install yourself – you might want to have a look at Split AC reviews in India, or your local area, for some ideas that won’t break your budget or your back! Could that baby cool. The bedrooms were at the back of the house, so they had to blast it on high at night to cool everyone while we slept. It was great. The only downside was that the first ones in the kitchen for breakfast suffered frostbite. Every morning, when we’d be at the kitchen table chopping through the milk frozen around our cereal, Dad would say, “Boy, this air conditioning is a lifesaver.” It really was. We were officially spoiled. I’m cutting back on calories because summer is here. And, no, I’m not watching what I eat because I’m getting ready for swimsuit season. I avoid swimming pools. The reason I avoid swimming pools is because I also avoided chemistry. In my mind, pools have always been large public bathtubs – with small children—and yet intelligent people actually put their heads underwater in large swimming pools. Other people, not me. I know there are chemicals that take care of germs and bacteria, but I just don’t understand chemistry well enough to trust it. Well, that and I’ve seen the massive amounts of chemicals dumped in pools and wonder why I’d want to swim in chemicals. All of which takes me to the beach. (Oh, please, yes, take me to the beach! Preferably, a rocky coastline with cool temperatures.) There are no chemicals in the water at the coast and what small children do there is washed out to sea. I’m good with everything at the coast—the tides, the surf, the waves—everything except sharks, jellyfish and riptides. But I’m not watching what I eat to get ready for the beach either. I’m getting ready for cake. Summer brings a crush of family birthdays—two in June, six in July and four in August. By the end of summer, nearly all the grands will have rolled over to “new numbers.” It’s a very big deal, like when a car’s odometer rolls over to 100,000 or 200,000. Once they all change up to new numbers the new line-up will be: 9, 8, 8, 7, 6, 5, 4, 3, 2, four-and-a-half months and four months. Our two new additions this spring threw our number run off a bit, but we’re keeping them anyway. The only problem is that you don’t roll over to that many new numbers without working your way through a lot of birthday celebrations and a lot of cake. If I hit every family birthday from early June through the end of August, I could be eating cake every three days. That’s so much cake that, even on the off-cake days, I’d be too full to walk to the ‘fridge and make a salad. Of course, nobody is forcing me to eat cake and ice cream at every birthday celebration, but children tend to notice if you’re not participating in the party. We are a family whose primary love language is food. To love is to eat, to eat is to be family. We’ve tried streamlining all these celebrations by grouping two here and three there, or meeting up for a birthday donut somewhere. Even so, we often wind up in a party streamer, birthday hat, blowing out the candles, white sugar, carbohydrate sort of daze some weeks. You count the days you have to recover until the next celebration. There’s no getting around it: summer means a lot of cake – no matter how you slice it.